I recently had the opportunity to review Data Rescue 4.2 from Prosoft Engineering, including a branded copy of their Bootwell USB thumbdrive. crashed, corrupted or non-mounting hard drives. accidentally reformatted hard drive or reinstalled OS. previous deletion, damaged or missing files. 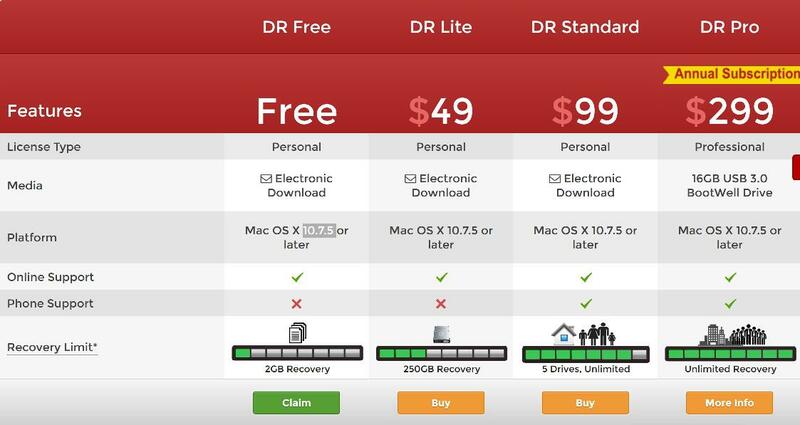 Data Rescue is available in several versions: Free, Lite, Standard, and Pro, each supporting different levels of file recovery on Mac OS X 10.7.5 and later. I tested these on three MacBook Pro and Air models, with SSD and traditional magnetic hard drives. Prosoft also provides their data recovery solution on a pre-configured 16GB USB “Bootwell” thumb drive, which I used in testing. You can also “roll your own” with any USB drive that’s at least 8GB in size. When attempting to use DR 4.2 on three separate machines, I initially encountered some errors preparing the software. I contacted their technical support staff via email, and while they attempted to be helpful, they were surprised at the error screen I reported, claiming to have never seen it before. After sending screenshots of the problems I was facing, they provided a workaround, allowing me to regenerate the recovery thumb drive, which was good. It was disappointing that the commercial product did not work “out of the box,” but comforting knowing that it was easily fixed, once the problem was identified. To test on a magnetic drive, I attempted to recover the contents of a VirtualBox virtual machine folder on a 3TB drive. I’d deleted the files the day before, and had been doing some light writing to the drive prior to attempting recovery. Running Data Rescue, I was quite surprised and pleased to see that the entire folder – over 30GB of data – was completed restored within a couple of hours. I then tested on my Mac’s internal SSD. I booted from the Bootwell drive, ran a “Quick Scan” and within minutes was able to identify numerous data files that I had deleted within the past few weeks. Using the built in storage on the 16GB Bootwell thumb drive, I selected 2GB of deleted files, including movies, installers, and MP3s, and restore them all without hassle. Next, I tested restoring files on a 4TB drive which I had reformatted as a Mac OS Extended, Journaled filesystem. I did not wait for the entire 4TB to be scanned (which Data Rescue estimated would take 18.5 hours) and completed the initial scan early after about 45 minutes. Despite my early termination, the program was able to successfully recover a lot of data from the drive, including files that I had deleted several months ago, despite my continued use of the drive. Then I tested recovering files from a 1GB thumb drive, formatted as FAT32. Although the recovered files were not as prevalent as on the other drives I’d tested, a number of deleted files were also available. The directory structure was not, but Data Rescue formatted the recovered files by type, sorting them into folders for Archives, Documents, Images, Movies, and Text, from which I was able to pick and choose files to restore. Finally, I tested on a Macintosh with a volume encrypted with FileVault. Nothing was recoverable. While I expected this would be the case, the software gave no indication that it was unable to restore files because of encryption – something I had to verify with technical support. A notice to the effect of “recovery of files from encrypted volumes is not supported” would be helpful. Data Rescue also includes a feature to Clone hard drives. Cloning can be useful if you suspect your drive is having hardware issues and you want a complete backup to move to, or if you want to make a copy for offline analysis without potentially erasing or corrupting data on the source drive you have – standard practice in data recovery and computer forensics. To test this, I cloned a 1GB USB flash drive to identical hardware. The clone appears to be exact, down to the device ID, as both drives showed up on my Windows computer as drive D:, even when plugged in simultaneously. Data Rescue 4 appears to be a solid product, and should be in your toolkit when you have to restore deleted files on your Mac. ⟵Does your site offer an open redirect?